This timeline has been abandoned. It looks like the Combine Overwiki has a superior, more thoroughly researched Half-Life timeline. My timeline is missing details from Half-Life: Decay, Half-Life 2: Episode Two, the Portal 2 ARG and Portal 2 itself, although it does have some idle conjecture that you might find interesting. The Combine, an exceptionally advanced other-dimensional race of whom very little is currently known, attack the "border world" of Xen. The dominant intelligent lifeforms on Xen are the vortigaunts. The Nihilanth, who may or may not already be the leader/ruler/tyrant/queen/mother of the vortigaunt race, is enslaved by the Combine and placed (possibly willingly) as a puppet ruler, leading the planet in the Combine's name. The vortigaunts are in turn enslaved with the metal collars which they are seen wearing in the original Half-Life games. The political situation on Xen is presumed to be exactly like the political situation on Earth during Half-Life 2. The Combine invaded, placed a ruler (in Earth's case, Wallace Breen) and began co-opting the local dominant species' genetics to make hybrid human/Combine slaves/foot-soldiers (whom you spend the entirety of HL2 fighting). Occam's Razor would suggest that Xen is the Nihilanth's homeworld. Several sources give Xen as a kind of refugee world and the Nihilanth and the vortigaunts as one of many groups of refugees on this planet, having come from somewhere else entirely. 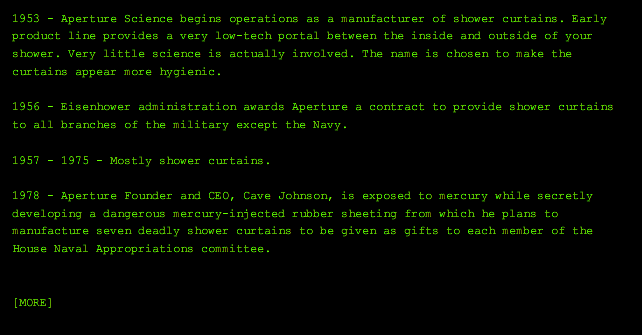 Aperture Science is founded by Cave Johnson, for the purpose of producing shower curtains. Aperture Science website (screenshot). To access the website sources, you can use the username and password seen in Test Chamber 17 in Portal. Type LOGIN and then username CJOHNSON and then password TIER3 and then NOTES to view the timeline. The Eisenhower administration awards Aperture Science a contract to produce shower curtains for all US military branches except the Navy. Gordon is 27 according to the opening text of Half-Life. Cave Johnson is exposed to mercury and becomes insane. Shephard is 22 according to the opening text of Half Life: Opposing Force. Terminally ill and believing that time is flowing backwards, Cave Johnson initiates research into (among other things) quantum portals through space. Conjecture: Cave Johnson does NOT die at this point. Instead he is placed in cryogenic storage to await his needed kidney transplant. The Aperture Science Self-Esteem Fund For Girls is founded. 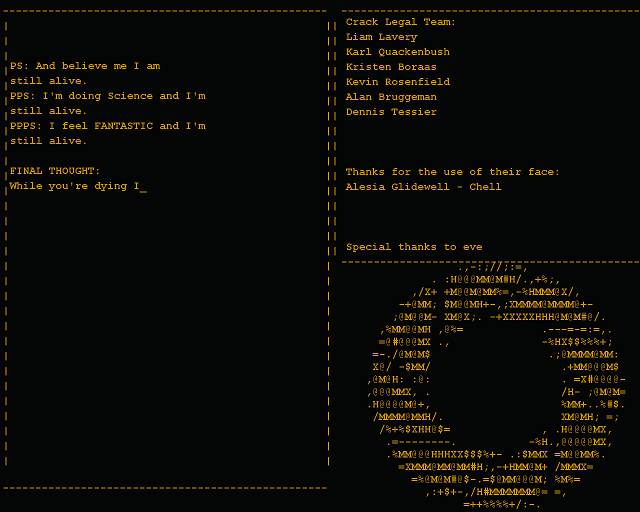 The Self-Esteem Fund is mentioned once in Portal and provides the title of one of the tracks on the Orange Box soundtrack. 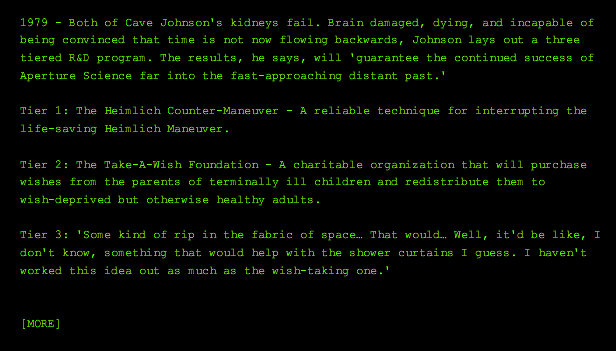 Conjecture: the Self-Esteem Fund is part of an effort to obtain a kidney for Cave Johnson. Surprisingly, actual progress towards the portal technology is revealed during a Senate investigation of Aperture Science. The company is awarded an open-ended contract to continue the research. Work continues on the "Portal" project. GLaDOS v1.07a and v1.09 released. 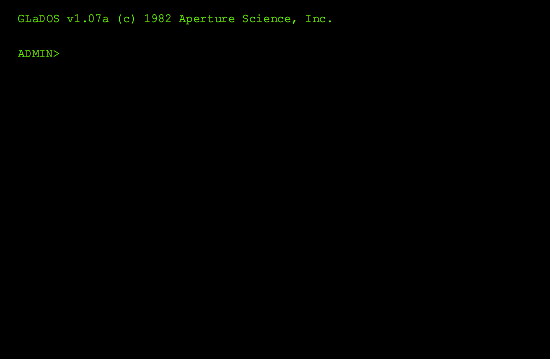 Cave Johnson has a user account created for him, or else his existing account details are transferred over from whatever internal computer system was in use at Aperture before this time. Aperture Science website (screenshot 1, 2). You can get to the 1.07a prompt by logging in as [any user name] with the password "PORTAL". Black Mesa Research Facility begins working on similar teleportation technology to the Aperture portals. 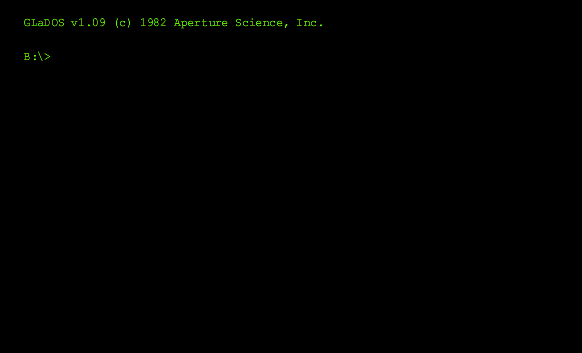 In response, work on GLaDOS, the Genetic Lifeform and Disk Operating System, commences at Aperture. This is after GLaDOS v1.07 has been released, but time was flowing backwards, so who knows? Source is the Aperture Science website (screenshot). The Aperture Science research vessel Borealis disappears from its dry dock, taking part of its dry dock with it. This is revealed in a pivotal conversation with Eli Vance in Episode Two, "Our Mutual Fiend". The ship's cargo will be revealed in Episode Three. Front-runner possibilities are volatile portal technology, volatile Xen crystals, and something involving time travel. Black Mesa scientists experience some success in their teleportation experiments and discover how to travel between Earth and the border world of Xen. They are unable to travel freely from place to place on Earth, because Xen is in the way. However, orange crystals are discovered on Xen, which, when connected up to a relay device which is placed permanently on Xen, can be used to bounce the signal from Xen back to Earth accurately. Contact is lost with the survey team which set up the relay, though the relay itself possibly remains functional for a little while longer. During "Captive Freight" in Blue Shift, Rosenberg makes a lot of the above explicit while powering up the original teleporter. A diagram of how this first teleporter works can be found here. Black Mesa scientists soon discover a new way of aiming the teleportation field, using Xen as a dimensional slingshot, allowing teleportation between points on Earth without any need for equipment to be stationed on Xen. A much larger teleporter, the Lambda Complex machine, is constructed. Stable site-to-site portals first appear in the Half-Life chapter "Lambda Core". In the "Captive Freight" chapter of Blue Shift, while powering up the original teleporter, Rosenberg explains how the Xen relay became obsolete. Judith Mossman explains the finer points of teleportation science during Half-Life 2, "Black Mesa East". A diagram of the new teleporter design is here. Despite their advanced technology, the Combine lack site-to-site teleportation. They are "dependent on local transportation" to get around on Earth, hence Razor Trains. Many samples of Xen fauna, including snarks, head crabs, barnacles, houndeyes and a Tentacle are brought from Xen back to the Black Mesa Facility for study. Xen-like environments are created to contain them. A domesticated barnacle is produced. Study of the mysterious orange crystal found on Xen also continues. Isaac Kleiner's pet headcrab, Lamarr, is possibly captured and debeaked at this point. That BMRF reached Xen before the resonance cascade is clear from Half-Life: "Apprehension". Gordon encounters a scientist lamenting about a sea monster which is terrorising that level, saying "They said it was hauled from the Challenger deep, but I'm positive that beast never swam in terrestrial waters until a week ago." In "Questionable Ethics" caged houndeyes appear. However, it's only in opposing Opposing Force: "Vicarious Reality" that it becomes clear just how long this has been going on. The Tentacle environment is very large. It must have taken months to construct. After ten years, GLaDOS is now an adequately functional Disk Operating System. Work begins on the Genetic Lifeform component. The Aperture Science Handheld Portal Device is completed. By this time GLaDOS has been developed into her familiar "hanging computer" configuration. Doug and Henry are two Aperture employees working on her artificial consciousness, and have attached three different AI cores (Cake, Curiosity and Anger) to GLaDOS in an attempt to prevent her from trying to kill everybody in the facility. A fourth core, Morality, is developed and attached to her. Portal 2: Lab Rat prequel comic. The first annual Bring Your Daughter To Work day takes place at Aperture. 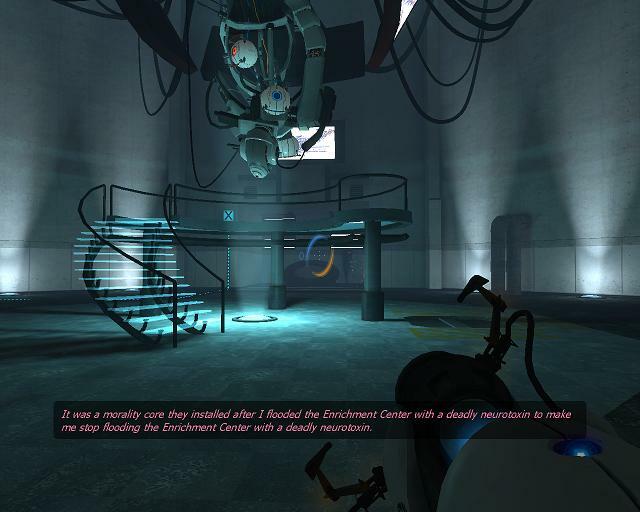 Chell, the adopted daughter of an Aperture employee, is in attendance, and agrees to be tested in the Computer-Aided Enrichment Center. She is placed in a Relaxation Vault. Meanwhile, GLaDOS is fully activated for the first time as part of several planned activities for the day. Chell's name is given in the credits for Portal. Her name is also found on her potato experiment in Portal 2. 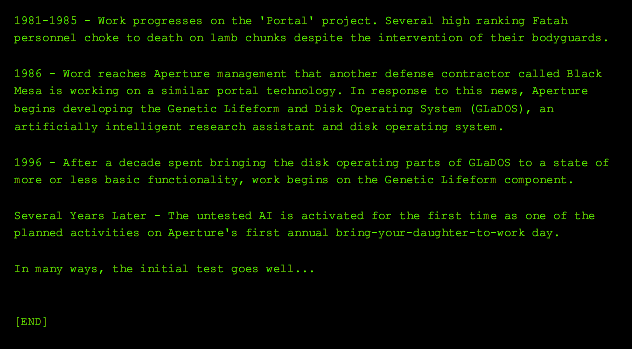 The activation of GLaDOS is noted in the NOTES file on the Aperture Science intranet. Bring Your Daughter To Work Day is mentioned once during the game and the connection is confirmed on the Aperture Science website (screenshot). The NOTES file is one to which CJOHNSON has access but, being written in the third person, it is probably accessible to other Aperture employees too, and not a file created by Cave Johnson personally. This is the last update made before GLaDOS malfunctions and floods the facility with a deadly neurotoxin. The scientists successfully install a Morality Core to shut the neurotoxin emitters down, but the facility is nevertheless fully evacuated. Chell is left behind inside her Relaxation Vault. The last scene before you fight GLaDOS in Portal gives the neurotoxin details. If GLaDOS was successfully neutralised, why was the facility abandoned anyway? Gordon Freeman is sent a letter offering a job at the Anomalous Materials Laboratory of the Black Mesa Research Facility at Black Mesa, New Mexico, United States. Between now and May 15 he returns from his present post as visiting fellow at the University of Innsbruck and is trained in the use of his HEV suit. The acceptance letter appears in the Half-Life manual. The actual year given on the letter is 200-, which is anywhere from 2000 to 2009. I have chosen 2000 since it is closest to the release date of Half-Life, is the date used by that other timeline. Several other events are pegged to this year, so pinning it to one moment is handy. It is implied that the resonance cascade occurs very early in Gordon's time at Black Mesa, possibly even on May 15 or 16. However, Alyx remarks in Episode One that Gordon and Barney used to compete at getting into Dr. Kleiner's laboratory without keys (thus, Gordon has some prior experience of vent-crawling). For such a thing to become routine in less than two weeks is pushing it, so I have moved the cascade to the following year. Adrian Shephard is given his soldier's manual. Date appears on the cover of the Opposing Force game manual. Scientists from Black Mesa successfully steal one of the four gigantic orange crystals in the Nihilanth's lair on Xen. This is the largest and purest sample retrieved so far and is the sample used in the anti-mass spectrometry experiment at the beginning of Half-Life. When you reach it, the Nihilanth's lair has three big orange crystals remaining, embedded in the walls. All three crystals resemble the one from the first experiment, and there is a hole where a fourth one should be located. The connection is clear. It's reasonable to assume that Black Mesa used teleportation technology to insert operatives close enough to retrieve the sample without being caught. They may have even teleported it out of the chamber directly without visiting it, or retrieved it accidentally. This event most likely occurs a very short time before the events of Half-Life pick up. The G-Man decides to cause a resonance cascade at Black Mesa Research Facility. Later events in this timeline will soon combine to show that this event was deliberately orchestrated by the G-Man. However, the background to this decision remains the single most important question mark in the Half-Life story. When did he make this decision? Before or after the pure sample was retrieved above? Before or after Earth made contact with Xen? Did he make the decision himself or was he ordered or hired to do it by a third party? What did he intend to achieve by causing the cascade? Were the actual consequences of the cascade (i.e. war with Xen, followed by eventual invasion by the Combine) were what he intended? Shephard is in boot camp still. He hears rumours of the G-Man observing proceedings. Note in the Opposing Force manual. Shephard is stationed at Santego Military Base, Arizona, according to the intro of OpFor. Shephard sees the G-Man for the first time and believes he is observing him personally. Note in the Opposing Force manual. Shephard and his unit, the Hazardous Environment Combat Unit, commence one week of solid training in indoor strategic combat but are not told why. Shephard hears the Black Mesa facility being mentioned a lot and becomes convinced he is being primed for a mission. Shephard has the rumour confirmed and is told to prepare for the event to happen tomorrow. Note in the Opposing Force manual. This pins down the resonance cascade to the day of March 16, whose events I shall detail in the best order I can figure, below. He is not, in fact, inserted until March 17. A major system crash at the Black Mesa Research Facility, orchestrated and triggered by the G-Man (before he officially arrives for the day), prevents scientists Dr. Isaac Kleiner and Eli Vance, who will be overseeing the morning's anti-mass spectrometry experiment, from knowing the dangerous properties of the sample which they will be analysing. A security guard at the front desk mentions this as Gordon arrives at the beginning of Half-Life. It happened "about twenty minutes ago" and Gordon arrives at roughly 8:50am. Doctors Gina Cross and Collette Green arrive for their morning's work and collect their HEV suits from the tubes flanking Gordon's. Because of the system crash they have to be re-added to the security database. Barney Calhoun arrives by monorail to take over security duties at the beginning of his shift. The door to his workplace jams as a result of the crash, just as Gordon Freeman passes him in another monorail car, also arriving for his morning's work. Blue Shift: "Living Quarters Inbound" followed by Half-Life: "Black Mesa Inbound" and Blue Shift: "Insecurity". The announcer in Gordon's car gives the time as 8:47am at roughly the same moment that Gordon passes Barney. Both Barney and Gordon observe the G-Man while he is inbound by monorail. On a security screen, Barney observes the Xen sample arrive at the Anomalous Materials lab, pushed by Gina Cross. The G-Man arrives at Anomalous Materials lab, ahead of Gordon. Gordon Freeman arrives at the Anomalous Materials lab and collects the third and final HEV suit. The monorail journey takes about three minutes from the "8:47am" announcement. Messing about in the lab kitchen, Gordon nukes the microwave casserole of Dr. Arne Magnusson. Magnusson develops a grudge about this. Magnusson's comment in Episode Two is by far the funniest moment in the Half-Life series to date. Gordon observes but does not overhear Eli's brief conversation with the G-Man, in which the G-Man presents the new Xen fragment to Eli and advises him to "Prepare for unforeseen consequences" during the forthcoming experiment. This G-Man sighting has been well-known since HL was released but the details of the conversation are only established in Episode Two, chapter 6, "Our Mutual Fiend". Given that all the black scientists in Half-Life look identical, we didn't even know it was Eli talking to the G-Man until Episode Two. Collette Green activates the anti-mass spectrometer. Gordon pushes the Xen sample into the beam, causing a resonance cascade. The Anomalous Materials laboratory and much of the surrounding Facility sustains massive damage as large random quantities of matter are spontaneously transported to and from the world of Xen, including dangerous Xen fauna which is teleported into the Facility. Chaos erupts. Eli Vance instructs Gordon to attempt to reach the surface and get help. Barney Calhoun, who is in a recently-repaired elevator at the time of the cascade, independently sets out to escape the facility too. Half-Life, chapters "Anomalous Materials" and "Unforeseen Consequences", Decay: "Dual Access" and Blue Shift: "Duty Calls". Since Gordon never returns, Eli eventually escapes the facility by himself. Eli possibly loses his left foot in the process. Alyx Vance is extracted from the Black Mesa Research Facility by the G-Man. The fact that Alyx and Eli's wife (whose name was Azian) lived in the Personnel Dormitories on the Black Mesa site should have been obvious from context as early as Half-Life 2. (We know from Gordon's acceptance letter that there are on-site lodgings, and Eli's wife was conspicuous in her absence from HL2.) However, it would have seemed reasonable to assume that Azian was killed during the evacuation after the Black Mesa Incident, and Alyx survived by dumb luck or youthful resourcefulness. It's only in the pivotal G-Man sequence in Episode Two, "This Vortal Coil", that the G-Man's role in Alyx's survival is revealed. By electing not to rescue Azian at the same time as Alyx, the G-Man effectively killed Alyx's mother. Alyx is given an initial "appraisal" by the G-Man's "employers" but they fail to see any value in her. This is understandable, since Alyx is only at most seven or eight years old at this time. By allowing her to grow up during the Portal Storm and the Combine invasion of Earth, she becomes a substantially more valuable asset in real terms. The G-Man reluctantly releases Alyx back to her father, but continues to take a constructive interest in her development. "Our Mutual Fiend" reveals that Eli knows that the G-Man rescued her. They may have met in person for the handoff. Alyx may or may not remember this. Gordon spends an entire day fighting his way through the damaged Facility towards the surface. By the time he gets there he has encountered the G-Man's special forces coming the other way, with instructions to kill all the civilians they find as part of a government cover-up. Gordon kills a large number of the grunts. Half-Life: "Unforeseen Consequences", "Office Complex" and "'We've Got Hostiles'". Barney's experiences are much the same, until Barney meets Dr. Rosenberg, who proposes an escape plan involving the original prototype teleporter (mentioned above, around 1986). Blue Shift: "Duty Calls" and "Captive Freight". At the end of "Duty Calls", Barney encounters two grunts dumping bodies and lamenting that "just because Shephard's team didn't make it, we have to do the crap jobs". This is because Shephard's Hazardous Environment Combat Unit hasn't arrived yet, not because they were shot down, which hasn't happened yet. Gordon continues to trek through the BMRF interior, kills a Tentacle and accesses an old subway system which leads towards the Lambda Complex at the far end of the Facility. Before dawn, Gordon successfully launches a rocket containing a satellite which the surviving scientists in the Lambda Complex need to shut down the link to Xen. Half-Life: "Blast Pit", "Power Up" and "On A Rail". Gordon reaches the surface towards the end of "On A Rail", by which time it is the middle of the night, if not early morning. Meanwhile, Barney and Rosenberg reach the prototype teleporter. Being an old model, it is not capable of moving objects from place to place on Earth; it can only send you to Xen or bring you back. As a result, Barney has to be sent to Xen to reactivate the relay which Black Mesa scientists originally left there. The relay's purpose is to seamlessly transmit the travellers from Xen back to a point on the outskirts of Black Mesa. Barney is then sent to collect power cells for the teleporter as well. Blue Shift: "Focal Point", "Power Struggle" and "A Leap Of Faith". By the time day has broken, mysterious Black Operatives have joined the invading human forces. By this time the effects of the resonance cascade have long ceased, but more and better-armed aliens are still teleporting in. This is because a formal invasion force has now been mounted from Xen, under the command of the Nihilanth. Earth is now in a de facto state of war with Xen. Gordon is captured by disgruntled grunts. Barney Calhoun, Rosenberg, Walter and Simmon(d? )s successfully teleport out of the Black Mesa Facility. Barney is briefly teleported to several other locations, and witnesses Gordon being dragged away by the grunts before snapping back to the exit tunnel and leaving the Facility safely. Gordon is put in a garbage compactor by the grunts. Adrian Shephard and the rest of his Hazardous Environment Comabt Unit are among the last grunts to be airlifted in to Black Mesa. Shephard is shot down by a Xen hovership before he can can be given any orders. He sets out on his own expedition through the Black Mesa Facility. Events of Half-Life: "On A Rail" and "Apprehension", Blue Shift: "Deliverance" and the opening of Opposing Force. Gordon Freeman escapes the garbage compactor into the Facility's Residue Processing system and spends the rest of the morning making his way to Lambda Complex. With Xenian forces overwhelming them, the human forces are told to forget about apprehending Freeman and pull out. Adrian Shephard attempts to join the evacuation but is prevented from doing so by an unsympathetic G-Man - who, despite appearances, does not actually leave the Facility at this point. Several other HECU soldiers are also left behind. The black ops remain on the site, however, and Shephard runs into them several times. The black ops are now, in turn, tasked with exterminating the grunts. The events of Half-Life: "Residue Processing", "Questionable Ethics", "Surface Tension", "'Forget About Freeman!'" and "Lambda Core", as well as Opposing Force: "'We Are Pulling Out'", "Missing In Action" and "Friendly Fire". 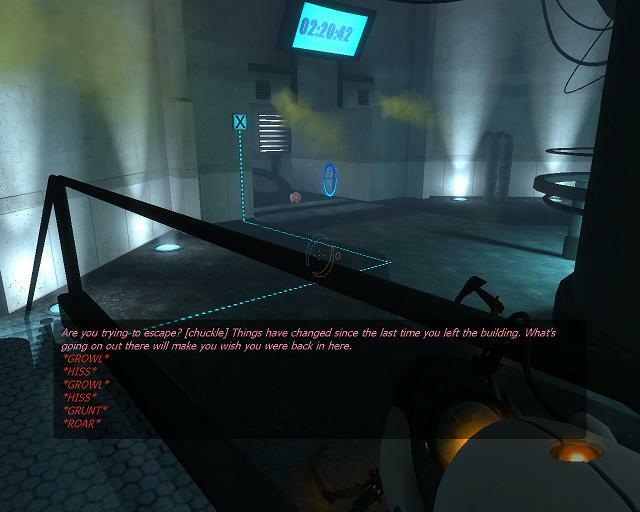 The Half-Life: Uplink demo was originally a chapter of Half-Life. It is stated to occur in the Lambda Complex and at "containment failure + 48 hours". It was removed from the final game and ends on a cliffhanger, but it can theoretically be inserted somewhere in "Lambda Core" (which is more like +30 hours but oh well). Gordon reaches Lambda Complex where he is told that the satellite he has launched cannot be used to close the Xen rift because the Nihilanth is holding it open. Gordon is sent to Xen to kill the Nihilanth. Xenians attack the Complex just as Gordon leaves, damaging it, destroying Gordon's route home. Adrian Shephard arrives at Lambda Core just in time to witness Gordon departing for Xen. Gordon succeeds in killing the Nihilanth. The G-Man, having observed Freeman's progress with great interest, consults with his "employers", extracts Gordon from the Nihilanth's chamber and offers him a job, which Gordon accepts. Gordon is placed into slow teleport, "awaiting assignment", and time ceases to pass for him. Wallace Breen notes during the final confrontation of Half-Life 2 that Freeman is a "pawn" and that his "contract was open to the highest bidder". In the closing sequence of the same game, the G-Man notes that he has "received some interesting offers for [Freeman's] services". This suggests that Freeman is essentially a mercenary and that the G-Man is his handler/employer. However, the G-Man himself also has "employers". The vortigaunt race is freed by the death of their immediate master. Meanwhile, Shephard escapes Lambda Complex into the Black Mesa animal laboratories. He defeats a Pit Worm and makes it to the surface again at around dusk. Because they are killed, the scientists of Lambda Core never actually manage to use the satellite to close the Xen rift. Not only does the rift remain partially active (if not fully open), the satellite remains in orbit, unused. Half-Life: "Xen", "Gonarch's Lair", "Interloper" and "Nihilanth" and OpFor: "We Are Not Alone", "Crush Depth", "Vicarious Reality", "Pit Worm's Nest" and "Foxtrot Uniform". The G-Man's remark that "The border world, Xen, is in our control" is of great importance. To whom does "our" refer? Despite the, hah, "illusion of free choice", Gordon's acceptance must be canonical. Shephard encounters Black Operatives planting and arming a nuclear device, intending to destroy the entire Black Mesa facility as a last-ditch attempt to prevent what is happening. Shephard disables the weapon, but the G-Man, after inspecting Shephard's work, reactivates it. Shephard continues onwards to where he encounters a Gene Worm coming through from Xen and defeats it. OpFor: "The Package" and "Worlds Collide". Though the radiation from the blast might slow down in the incoming Xen forces, it seems unlikely that a nuclear explosion would actually prevent them from teleporting in. Logically, the bomb is only placed after Gordon defeats the Nihilanth. There is no particular explanation for the origin of the Race X creatures which are encountered in OpFor and nowhere else. In fact, they are never even named in the game. They could be more of the Nihilanth's race, or they could be an entirely separate race which shares Xen with the Nihilanth, or they could be from a different border world entirely. The G-Man extracts Shephard from the Gene Worm arena, and, with the permission of his "employers", places him into a slow teleport for possible future reference. The nuclear bomb goes off, destroying the entire Black Mesa Research Facility. While scientific masterminds Eli Vance, Isaac Kleiner and others successfully escape the detonation, all their notes and equipment are destroyed. Human teleportation science takes a step backwards. Closing scenes of Opposing Force. It is daylight during the part of this scene which takes place in New Mexico, but night was falling last time Shephard was outside (during "Foxtrot Uniform") so this must be the following day. Following the death of the Nihilanth, freed vortigaunts from Xen migrate to Earth for relative safety, and the Combine become aware of the planet Earth and the still-open rift between it and Xen. Portal Storms occur - due to the rift or the Combine or both - dropping dangerous fauna from Xen on the Earth. The countryside becomes swarmed with antlions and headcrabs and the oceans fill up with killer leeches. Humans withdraw into fortified cities. the Combine have humanity's best interests at heart, which is not. This is Alyx Vance's childhood. These events are mainly surmised from newspaper clippings in Eli's lab, Half-Life 2, chapter 5, "Black Mesa East". Specifics are sketchy. Date is taken from a promotional website which indicates that Half-Life 2 takes place "nearly two decades" after Half-Life. During Episode Two, "This Vortal Coil", Freeman's vortigaunt partner notes that the vortigaunts once farmed antlions for their larvae. Thus, presumably the antlions are from Xen just like the vortigaunts are. prevent headcrabs from assimilating Combine forces. The Combine anti-headcrab field is a personal hypothesis of mine, introduced to explain why no Combine zombies appear until the beginning of Episode One. Combine citadels are established in cities. The Combine begin draining the oceans and harvesting useful minerals from the Earth, sucking it dry. Nova Prospekt, a prison near City 17, is set up as a major Combine base (experimentation facility and teleporter landing pad connecting their universe to ours). Experiments on humans produce the Combine Overwatch soldiers - the human equivalent to vortigaunt slaves - and the fearful subhuman Stalkers. Soon it has become routine to transport humans to Nova Prospekt by train in order to convert them into Stalkers. Captured refugee vortigaunts are also sometimes taken to Nova Prospekt - being telepathic, they are sometimes able to send pictures back to the resistance before being tortured and killed. Eli Vance, Judith Mossman, Isaac Kleiner, Barney Calhoun, Alyx Vance and Arne Magnusson are among the survivors of Black Mesa who make their way to City 17. Discovering what is happening at Nova Prospekt, they set up an "underground railroad" to ferry incoming human "livestock" out of City 17 to safety. Barney Calhoun infiltrates the Overwatch and works undercover to assist in this; Kleiner (along with his headcrab Lamarr) operates out of a lab near the inbound railway station; Mossman and the Vances work out of "Black Mesa East", a lab near the town of Ravenholm. A large number of resistance members and several sympathetic vortigaunts end up working on this railroad, which is signposted with yellow Lambda symbols. However, it still involves a long trek down the old canals to get to Black Mesa East, so the scientists begin work on a teleporter which can make this journey infinitely easier. The rescued proles, possibly including Father Grigori, colonise the abandoned nearby mining town of Ravenholm. Most of this is established during the early scenes of Half-Life 2. It is never explicitly stated that the Combine have begun draining the oceans, but a suspiciously large number of beached ships appear in the "Highway 17" and "Sandtraps" chapters of HL2. Ravenholm is bombed with headcrab-filled missiles. The headcrabs assimilate most of the town's population, with the notable exception of Father Grigori. The survivors, if there are any, escape through the mines to the coast. The underground passage from Black Mesa East to Ravenholm is sealed off to prevent the headcrabs from spreading. "We don't go there anymore." Obviously the Combine weaponised the headcrabs a long time ago, as seen above. The new poison headcrabs and fast-moving headcrabs may be previously-unseen natives of Xen, but it is also possible that they were created by the Combine using genetic engineering, or even simple breeding. Isaac Kleiner completes the new underground railroad teleporter. Gordon Freeman is woken by the G-Man and reinserted into reality on a train inbound to City 17 and Nova Prospekt. HL2: "Point Insertion". Note the passenger on the inbound train who remarks "I didn't see you get on." Presumably, the G-Man is still working for the same "employers" and working towards the same ultimate goal as he was during Half-Life. The G-Man's remarks, "And all the effort in the world would have gone to waste until..." and "The right man in the wrong place can make all the difference in the world" imply that he has limited resources. He waited for this precise moment - i.e. when the teleporter was operational - to reinsert Freeman, because it was the moment when he stood the best chance of doing the maximum possible damage to the Combine operation on Earth. Barney Calhoun (in his disguise as a member of the Combine Overwatch) spots Gordon and helps him escape. Freeman is eventually rescued from Civil Protection by Alyx Vance and taken to Kleiner's lab. Alyx is successfully teleported to Black Mesa East but Gordon's jump fails and he is forced to use the "underground railroad". Gordon momentarily appears in Wallace Breen's office during the failed jump. Breen instantly recognises him and alerts his Combine Advisor superior. Within hours the entirety of Civil Protection is after him. "'A Red Letter Day'", "Route Kanal". Being responsible for the death of the Nihilanth, Freeman is much more of a threat to the Combine than he is to Breen. Also, Breen has no real power. It is presumably the Combine Advisor, not Breen, who gives the order for City 17's forces to locate Gordon. Though the underground railroad and most of the people maintaining it are destroyed by this unprecedented movement, Freeman reaches Black Mesa East by nightfall. Around this time, Judith Mossman makes a deal with Breen to turn Freeman over to the Combine in exchange for the safety of Eli Vance. She argues that Eli will eventually come around to the Combine point of view: the truth is that she has personal feelings for him. Having covertly followed Freeman, the Combine jump the gun, launching an attach on Black Mesa East without waiting for Judith Mossman's signal. Alyx Vance and Gordon Freeman separately escape the attack. Later in the game ("Entanglement") it transpires that Mossman was intending to summon Combine forces to try to take Freeman anyway: "You would have had him if you had just waited for my signal". Because the Combine don't have Freeman, Mossman's deal for Eli's safety is off, so the Combine capture Eli Vance and take him to Nova Prospekt. Judith Mossman is taken too. Freeman escapes through the Ravenholm tunnel. Aided by Father Grigori, who is now insane, Freeman spends the night fighting his way through Ravenholm and the Ravenholm mine. He reaches the surface near the coast at dawn the following day. HL2: "'We Don't Go To Ravenholm...'". Though, of course, speed runners can devour the entirety of HL2 in a matter of two hours, it seems like the night in Ravenholm takes rather less game time than the day. This could be held suggest that it is local summertime. Freeman reaches the surface near a resistance base which is under attack. The resistance supplies him with a dune buggy and Freeman spends the day negotiating the coast road connecting Ravenholm to Nova Prospekt, overcoming Combine ambushes and defending resistance bases from attack the entire way. He arrives at Nova Prospekt at dusk. Freeman and Alyx independently assault and penetrate the Nova Prospekt facility in an attempt to rescue Eli and Mossman. They meet up inside the facility and discover that Mossman is still walking around freely due to her (slight) betrayal, and still trying to bargain for Eli's life. Mossman sets up the Combine's Nova Prospekt portal to emulate the human science team's "Xen relay" - which the Combine have not discovered, remember - and escapes through it to the Citadel, taking Eli with her. Alyx quickly restarts the portal and she and Freeman use it to escape. The portal explodes as they 'port out, with the result and Alyx and Freeman are sent on a "slow teleport" journey which will take over a week to complete. The explosion of the Combine portal makes it impossible for more Combine forces to be dispatched to City 17. This, coupled with Alyx and Freeman being presumed KIA, is taken as a signal for the human resistance to begin its uprising against the Combine. During this chapter, Breen makes a semi-public announcement informing the Overwatch that Gordon Freeman has - to paraphrase - "not been in a position to gain covert skills" since the Black Mesa incident. Breen knows that Gordon was frozen in time for this period. He must have been told this by the Combine. This in turn means that the Combine have some awareness of the G-Man's activities against them. Dog makes it back to Kleiner's lab from Black Mesa East. Alyx Vance and Gordon Freeman arrive at Kleiner's lab after their "slow teleport" journey. Their journey was subjectively instantaneous. HL2: "Entanglement", "Anticitizen One", "'Follow Freeman!'". Alyx and Freeman left Nova Prospekt in the middle of the night and arrive at Kleiner's lab during daylight hours, and apparently the Nova Prospekt explosion was "more than a week ago". So, for the sake of argument, I am assuming that the elapsed time was seven days plus a few hours, placing this at Red Letter Day + 8. In case it's not clear, this explicit jump in Gordon Freeman's personal timeline is what leads most commentators to believe that Freeman was also frozen in time between Half-Life and Half-Life 2. The G-Man evidently has "slow teleport" technology, just as he has "conventional" teleportation as demonstrated in Half-Life and the expansion packs. Alyx and Freeman join Barney Calhoun, Dog and many others in the assault on the Combine Citadel. Alyx is captured by the Combine. That evening, the Citadel is reached. Dog provides Freeman with a route through the "walking walls" and into the Citadel core. Gordon Freeman infiltrates the Combine Citadel but is himself captured, along with Eli and Alyx. Breen tries to make Eli tell the resistance to stand down and let the Combine win. Eli refuses. Breen suggests installing Freeman as the leader of the resistance instead, if he will deliver the message instead. Breen says that having both Eli and Freeman in his keeping will allow him to dictate terms to the Combine-- presumably because they represent a significant combined threat. Breen evidently knows more about Freeman's "employment" than Freeman does. Presumably he has been kept informed by the Combine, who are in turn aware of the G-Man's (and the G-Man's employers') movement against them. Mossman redeems herself by intervening to save Eli. Alyx, Eli and Freeman are freed, while Breen escapes. Breen attempts to transfer himself into a host body and escape through a Combine portal to another universe. Freeman destroys the portal, destabilising the Citadel's teleport core and causing it to detonate. The detonation has a knock-on effect on the other Citadels. Earth's connection to the Combine universe is severed. HL2: "Our Benefactors", "Dark Energy". The sky during these chapters indicates that night is falling. The G-Man again retrieves Gordon Freeman - and possibly Alyx too - and places him into storage for future reference. However, vortigaunts intervene, forcibly removing Gordon Freeman and Alyx Vance from the G-Man's control and spiriting them away. The opening sequence of Episode One is curiously difficult to reconcile with the conclusion of Half-Life 2. It almost seems as if the vortigaunts interrupt what the G-Man was about to say, preventing him from delivering his speech about "the illusion of free choice" and so on, and altering the course of events. That the G-Man has an interest in Alyx and might therefore have used this opportunity to "adopt" her too is made clear in the pivotal scene in Episode Two, later. Breen also escapes the detonation. His mind is transferred into the host body of a Combine Advisor. Meanwhile, Eli and Mossman escape the Citadel, presumably via Razor Train. Eli returns to Kleiner's lab while Mossman sets off on another task entirely. It seems as if there is another gap in Gordon Freeman's "record" between the conclusion of Half-Life 2 and the point at which Episode One picks up. By the time of "Undue Alarm" at the beginning of Episode One, Eli Vance and Judith Mossman have had time to rendezvous with Isaac Kleiner, evacuate City 17 entirely and make it all the way to White Forest, and Judith has in turn - and for reasons yet unknown - set off by helicopter for the wreck of the Borealis. That has to be at least a few hours! By this time the detonation of the teleport core at the top of the Citadel is complete, and a great deal of destroyed Citadel has fallen into the city below. In addition, the Combine anti-antlion field has collapsed, allowing antlions to begin burrowing into City 17. The human reproductive suppression field has also collapsed. However, the Citadel itself is still intact for the moment. The Combine anti-headcrab field has also collapsed by now which is why "Zombine" soldiers now start appearing. Severed from the Combine universe, Combine forces arrange for the Citadel reactor - this time referring to the much larger reactor housed deep underground below the building - to overload. The result will be a colossal "dark energy flare" which is powerful enough to transmit a single packet of information through to the Combine universe... and incidentally completely destroy City 17. Isaac Kleiner and others reactivate as much local transportation as possible so that the city can be evacuated, and broadcast an announcment outlining these facts to the citizens. Both Freeman and Vance are teleported by vortigaunts to the rubble immediately below the Citadel. Alyx recovers first, possibly having been discovered and rescued by Dog, who has been waiting outside since helping Freeman enter the Citadel earlier that day. She and Dog then uncover Freeman. They restore contact with Eli Vance and Isaac Kleiner who inform them about the flare, which they presume to be an accidental result of the damage done to the Citadel. Dog helps them re-enter the Citadel. Episode One: "Undue Alarm". The "Kleinercast" doesn't appear until later. While moving through the highly unstable Citadel, Freeman and Vance encounter a recording of Breen agreeing to be placed in a host body. Then, a life-support pod containing a live Combine Advisor inflicts them with powerful mind-blasts before jetting away. From a dramatic point of view, there is no reason for replaying the Breen sequence at this point... unless, of course, the Combine Advisor seen in this chapter actually contains uploaded Breen's mind. Thus, this seems like a very safe assumption. If Breen can't survive in the Combine Advisors' world, it is logical that the Combine Advisors would need life support to survive in ours. Soon after, Vance uncovers evidence that the reactor overload is intentional, not accidental, and retrieves a copy of the content of the data packet that the Combine intended to send, though she cannot read it. By this time, Mossman has located the site of the Borealis and sent back some video-- however, the Combine have caught up with her. 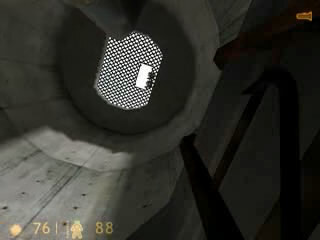 Vance retrieves this video too, while Freeman stabilises the reactor. The two attempt to escape via Razor Train. However, the train derails and they continue their evacuation of City 17 on foot. As they do so, the Combine restart the reactor overload procedure. The heroes have bought a few hours, but that is all. Episode One: "Undue Alarm" and "Direct Intervention". Why does the train derail? Presumably due to antlion activity under the lines. Vance and Freeman fight their way through an antlion-infested underground parking structure and reach the surface early in the morning. They spend much of the day working their way through the remaining Combine forces in City 17, catching up with Barney Calhoun in the process. All three escape the city by conventional rail. As Vance and Freeman are leaving the city, pods containing Combine Advisors are jettisoned from the Citadel and across the surrounding countryside, inflicting them with mind-blasts as they pass overhead. The Combine dark energy flare is triggered. The mysterious data packet is sent home to the Combine universe, and the Citadel detonates, completely destroying City 17 and everybody left within the city limits, and once again derailing Vance and Freeman's train. Episode One: "Lowlife", "Urban Flight" and "Exit 17". While underground, Vance inexplicably "hope[s] that it's still light out" despite the fact that their journey began at night. The "Kleinercast" seen when they reach the surface reveals several of the facts mentioned just above, as well as confirming the theory that a "tiny crack" remained after the Black Mesa event was settled, through which the Combine launched their initial attack. Notice how the final train passes the outer "walking wall" of the city just as the explosion begins. "Ratman" is woken up by GLaDOS and led through the Aperture Science Enrichment Center Test Chambers. He gets as far as Test Chamber 17 or so, but is unable to solve the puzzle, goes mad, hallucinates that the Weighted Companion Cube is talking to him, and escapes the test chambers via Chamber 16, scrawling "THE CAKE IS A LIE" and other helpful directions on the walls on his way out. The Portal 2 prequel comic reveals that, contrary to previous conjecture, Ratman is not Cave Johnson himself but another Aperture employee. 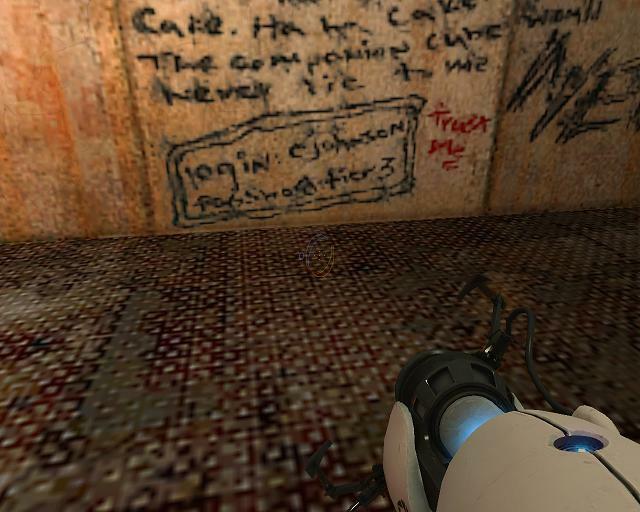 Among the things Ratman has scrawled on the wall is the CJOHNSON/TIER3 username/password for use on the Aperture Science website - or rather, within the Half-Life universe, on the Aperture computer terminals. How does he know this login? 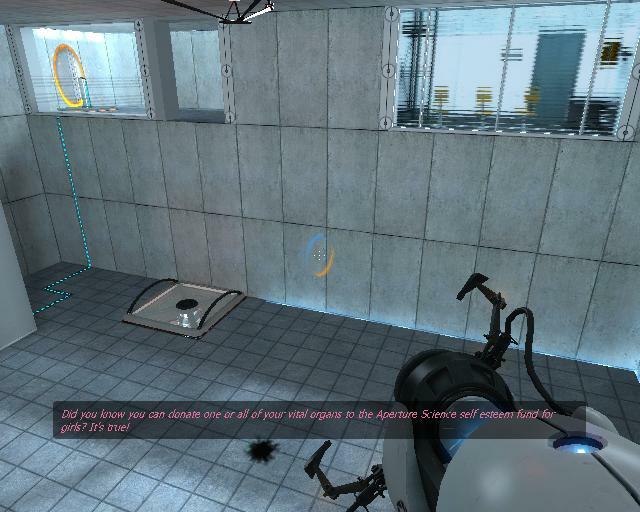 Chell is woken up by GLaDOS and solves all the Aperture Science Test Chambers. 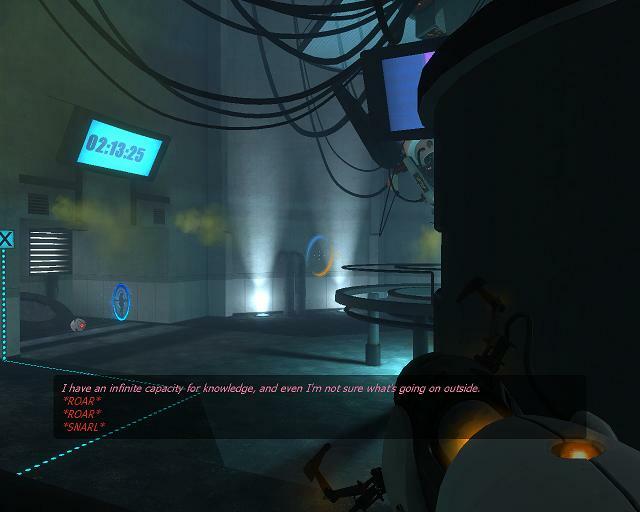 She escapes into the "backstage" area of the facility, confronts and shuts down GLaDOS. In the ensuing explosion, Chell is jettisoned to the surface outside the facility and falls unconscious. She is taken back inside the facility by a robot and placed into cryogenic storage. Ratman, with his beloved Weighted Companion Cube in tow, observes Chell's progress. The Portal 2 prequel comic, "Lab Rat", reveals Ratman's story. Based on GLaDOS' comments about the world outside during the final confrontation, Portal takes place during or after the Portal Storm. "Bring Your Daughter To Work day is the perfect time to have her tested" - Chell agreed to do some "testing"
This seems like a great pity since these all worked really well in the context of Portal alone. But oh well.